This fabulous work of art was created by Kevin Eastman and published by IDW in 2015. 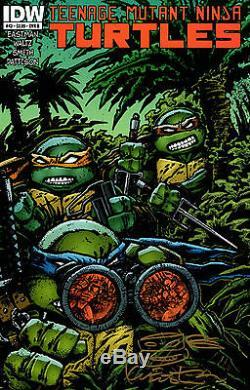 It was created as the cover of Issue #43 in the ongoing award winning TMNT series and is a terrific example of Kevin's fun sense of humor in creating these covers. This original artwork measures 11" x 17". The artwork is signed by Kevin Eastman upper left - Eastman'15. 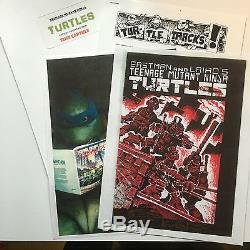 This unique package is accompanied by a hand made and signed TMNT Time Capsule , ensuring that you know the original art comes directly from the personal collection of Kevin Eastman and also a copy of the book, signed on the cover with a headsketch in gold ink. The time capsule includes a hand signed Turtle Tracks letter of thanks from Kevin, a signed photograph and a history of highlights in the life of the TMNT. This offering represents an excellent opportunity to acquire original Teenage Mutant Ninja Turtles artwork straight from the artist. 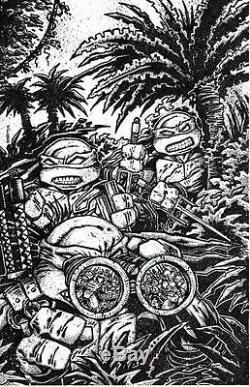 The item "TMNT#43 Original Cover Art and Signed book, Kevin Eastman 2015" is in sale since Tuesday, September 27, 2016. This item is in the category "Collectibles\Comics\Original Comic Art\Drawings, Sketches". The seller is "kevineastmanstudios" and is located in Northampton, Massachusetts. This item can be shipped worldwide.